Like many Wisconsinites, I’ve spent plenty of summer nights listening to family and friends reminisce and tell stories as our campfire turned to embers. On some nights, the stories move between genres as the tellers take their turns: horror turns to comedy, or a somber memory leads to glad reflections. Long after the fire is out, the best stories—like the smell of wood smoke—often follow you around for days. So it is with Nickolas Butler’s new collection of short stories, Beneath the Bonfire. 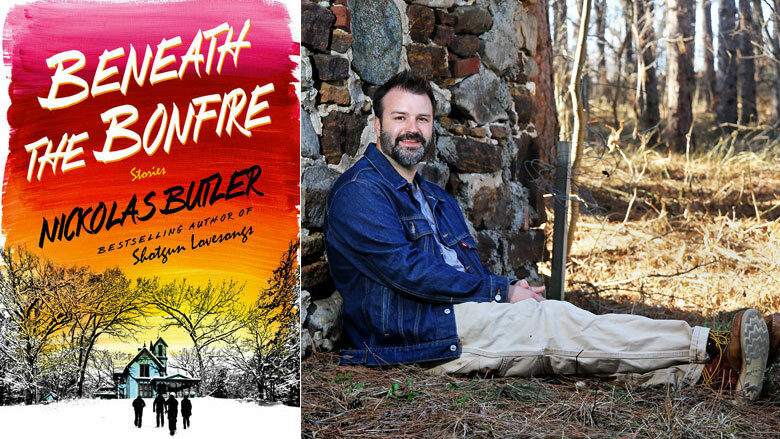 Although some of the stories in Beneath the Bonfire veer toward the conventional—a lonely young woman clings to an abusive lover, old friends grow apart, a man fears the loss of his girlfriend—Butler finds a way to subvert our expectations. “In Western Counties” feels in many ways like the classic tale of a rogue cop who goes outside the law to combat corruption in the community (in this case western Wisconsin farmland stands in for a gritty, urban setting). But instead of a Clint Eastwood-type, our hero is a retired female police officer struggling with early symptoms of Alzheimer’s Disease. Justice seems to be on Butler’s mind in this collection. In the case of “Sweet Light Crude,” when a retired eco-terrorist forces an oil executive to drink the very crude that was spilled in the gulf, we’re forced to question our own quick assumptions as Butler reminds us that behind the corporate suit is just a person. These stories aren’t all grit and revenge. Though some deal with the worst of people—abusive dog-fighters or drunken revelers who flee from a tragic automobile accident—others, like “Apples,” are mellow reflections on finding happiness. In many ways, it’s the distance between these stories that makes them so satisfying to read again and again. A poet as well as a novelist, Butler succeeds admirably in the short story form. In Beneath the Bonfire, he’s given his readers a portrait of emotional depth and sprawling Wisconsin lands through stories that traverse the hills and valleys of joy and sorrow. Formerly the web editor for the Wisconsin Academy, Zachary graduated in 2015 with a degree in Professional Writing and Publishing from UW-Whitewater, where he served on the staff of The Muse, the university’s literary and arts publication, and covered business and technology for the campus newspaper, The Royal Purple.